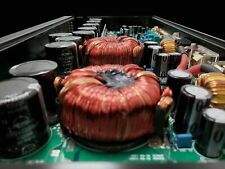 SPL APE1-6000D 6000 Watt 1 Ohm Class D Mono Subwoofer Amplifier 3300W Rms Used SPL APE1-6000D 6000 Watt 1 Ohm Class D Mono Subwoofer Amplifier 3300W Rms Used. - Subwoofer Grills. Subwoofer Exception : Our warranty does not cover blown voice coils, or subwoofers that have been punctured. Hertz HP802. 2-Channel/Mono mode subwoofer amplifier. Bandpass Filter: 50-10,000 Hz (HI)/50-10,000 Hz (LO). Lo-Pass Filter: 50-1,000 Hz/500-10,000 Hz. Hi-Pass Filter: 50-1,000 Hz/500-10,000 Hz. CEA-2006 compliant. I'm pretty sure if your looking at this you know exactly what it is. 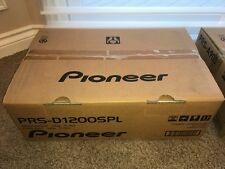 But if not here is the discription from SPL 3000c1. Optional remote available. Bass adjust 0-12 dB from 30 Hz -90 Hz. 0-180° phase shift. VFL PRO 3K Features. 1 OHM STABLE D CLASS MID RANGE AMPLIFIER. VARIABLE BASS BOOST: 0 - 9dB AT 45 Hz. LOW LEVEL INPUT & OUTPUT. From PA systems, turntables, and rack gear to cables, stands and subwoofers, VIP Pro Audio has all facets of the market covered! Mono-Block Car Audio Amplifier Amp. THIS WILL BE THE CLEANEST AMPLIFIER YOU HAVE EVER USED. THIS IS A COMPETITION AMP AND IT IS UNDERRATED FOR COMPETITION USE. High bandwidth Burr-Brown amplifier section. Critical Mass Audio is well known for there superior audio engineering, and designs. 1 Ohm Stable Class D Mono Block Amplifier. Varaible Bass Boost: 0 ~ 9db. 2500 Watts Max. Low Level Input and Output. Variable Low Pass Filter: 35Hz ~ 250Hz. 5 lb and over. 13 oz to 4 lb. 12 oz or less. New American Bass SQ Mono Amplifiers Bass VFL Comp 4K Class 4000W SPL Powerful!! Our VFL Comp Amplifiers feature Class D, 1 ohm Stable,Monoblock, Linkable Technology. These amplifiers achieved a score of 179.7dB in DB Drag and are World Renowned for their Unparalleled Power Output and Reliability. Brand New QP6100D 6000 Watt Class D Mono Block Amplifier 6k High SPL Free Kit!! Class D Mono Block Amplifier. Q-Link Protection Circuitry. Power @ 1 Ohm mono 3000 Watts. Power @ 2 Ohm mono 1550 Watts. 24dB / Variable Low Pass Crossover. Variable Subsonic Filter. Variable Bass Boost @ 45 Hz. DS18 HOOLIGAN-8K Monoblock Amplifier. Monoblock Class D Amplifier. 8,000 WATT RMS COMPETITION AMPLIFIER. Rms Power: 3,000W x 2 @ 4-ohm. Rms Power: 5,000W x 2 @ 2-ohm. Rms Power: 8,000W x 1 @ 1-ohm. Sorry no APO's, FPO's, Po Boxes, Alaska, Hawaii, Puerto Rico, or CODS. ETON FORCE FA 3500. The historical success of the FORCE amplifier series is impressive. The three models won brutal SPL battles since they appeared on the market. But moreover they were used to enjoy music in combination with woofers from the MOVE or FORCE series. New American Bass SQ Mono Amplifiers Bass VFL Comp 3K Class 3000W SPL Powerful!! VFL AUDIO Competition Amplifier 3000 Watts RMS D class. Mode : VFL-COMP 3K. Category : Mono Amplifiers. Low level input and output Frequency response 20Hz to 350Hz. We are not responsible for international custom fees. HOOL-SPLXV besides its 10K W RMS, its red aluminum finish, makes it a sophisticated amplifier, one of a kind. 1 Ohm RMS Power (18V) Per Channel: 10,000W(18V). 2 Ohm RMS Power (18V) Per Channel: 5,500W (18V). 5000W x 1 CH @ 1 ohm mono. AUDIO LEGION High End Car Audio Amplifier. One Year Warranty Through Audio Legion! Authorized dealer for Zapco, Phoenix Gold, Stinger, Image Dynamics, Audio Legion, Pioneer, OZ, JVC, PRV /// Brazil, Massive Audio. Highest sound spheres with ideal price/performance ratio. ETON shows how an ideal successor should be. A clear gain of power of the ECS 1200.1 makes this amplifier the best choice for any kind of subwoofer. DS18 HOOL-SPL3.5K Hooligan 3500 Watts Competition Class D Monoblock Amplifier. Pricedrightsales was founded in Lincoln Nebraska in 2010 and has continued to grow in size providing great quality products at great prices. CLASS D AMPLIFIER. IT WAS A DISPLAY MODEL. DS18 HOOL-SPL5K Hooligan 7800 Watts Max Competition Class D Monoblock Amplifier. Pricedrightsales was founded in Lincoln Nebraska in 2010 and has continued to grow in size providing great quality products at great prices. All the Audio Legion amplifiers including the AL2500.1D are manufactured in South Korea and designed for competition level output. Each of the five current models are rated and stable at one ohm. Whether driving a competition system shooting for 160 scores or slamming your daily subs, the AL amplifier line will exceed your expectations. 1 Ohm RMS Power (14.4 V) Per Channel 1x8500W. 2 Ohm RMS Power (14.4 V) Per Channel 1x4300W. 4 Ohm RMS Power (14.4 V) Per Channel 1x2300W. 1 Ohm RMS Power (16V) Per Channel 1x10,800W. Speaker Impedance Range 1- 4 ohms. 1 Ohm RMS Power (14.4 V) Per Channel 1x5000W. 2 Ohm RMS Power (14.4 V) Per Channel 1x2800W. 4 Ohm RMS Power (14.4 V) Per Channel 1x1500W. 1 Ohm RMS Power (16V) Per Channel 1x6500W. Number Of Channels 1. Hooligan SPL Series competition amplifiers. Engineered in the US, manufactured in South Korea, and Independently Tested vs. Competing amplifiers. Use to power the best subwoofers in the market. The HOOL-SPL5K1 provides SPL for audiophiles seeking maximum power with unparalleled performance and sophistication. DS18 HOOLIGAN - 8K Competition Amplifier. DS18 Marine Audio Logic PRV Timpano Massive Audio. 4 Channel Amplifier Class A/B Amp 1600 Watts Max GEN-X1600.4 DS18 Pro Audio. 3 Foot RCA Cable High Quality Performance OFC Noise Rejection Cable DS18 R3. 6500W x 1 CH @ 1 ohm mono. AUDIO LEGION High End Car Audio Amplifier. One Year Warranty Through Audio Legion! Authorized dealer for Zapco, Phoenix Gold, Stinger, Image Dynamics, Audio Legion, Pioneer, OZ, JVC, PRV /// Brazil, Massive Audio. AUDIO LEGION High End Car Audio Amplifier. One Year Warranty Through Audio Legion! Authorized dealer for Zapco, Phoenix Gold, Stinger, Image Dynamics, Audio Legion, Pioneer, OZ, JVC, PRV /// Brazil, Massive Audio. For sale a working American Bass 750.1 SPL AMP. Great working condition, a few blemishes on the outside pictured in the photos. 1 OHM Stable D Class Monk Block Amplifier Only one on market. Let me know if you have any questions. All of the Audio Legion amplifiers including the AL6500.1D are manufactured in South Korea and designed for competition level output. Each of the five current models are rated and stable at one ohm. 1 Ohm RMS Power (14.4 V) Per Channel 1x8000 W. 2 Ohm RMS Power (14.4 V) Per Channel 1x5000 W. 4 Ohm RMS Power (14.4 V) Per Channel 1x3000 W. THD <0.01%. Signal-To-Noise Ratio ≥ 95 dB. Power Input 2X 0GA. All of the Audio Legion amplifiers including the AL5000.1D are manufactured in South Korea and designed for competition level output. Each of the five current models are rated and stable at one ohm. US Acoustics “ Brad” 12” dual 2 ohm subwoofer. Everyone loved getting a demo in the blazer because these subs loved everything from 20HZ-60HZ. Don’t pass up this amazing deal. US Acoustics “Mike” 1500.1. 2500W x 1 CH @ 1 ohm mono. AUDIO LEGION High End Car Audio Amplifier. One Year Warranty Through Audio Legion! Authorized dealer for Zapco, Phoenix Gold, Stinger, Image Dynamics, Audio Legion, Pioneer, OZ, JVC, PRV /// Brazil, Massive Audio. All of the Audio Legion amplifiers including the AL3500.1D are manufactured in South Korea and designed for competition level output. Each of the five current models are rated and stable at one ohm. Latest Monoblock Class D High Performance Circuit Design. Rms Power: 1,300W x 1 @ 4-ohm. Rms Power: 2,000W x 1 @ 2-ohm. Rms Power: 3,000W x 1 @ 1-ohm. The EXL-SQ3000.1 is for the people who live and breathe car audio. DS18 PRO-SPL8.5K Monoblock Amplifier. Rms Power @ 14.4V Rms Power: 2,300W @ 4-ohm. Rms Power: 4,300W @ 2-ohm. Rms Power: 8,500W @ 1-ohm. Rms Power Linked: 14,000W @ 2-ohm. Rms Power @ 16V Rms Power: 3,300W @ 4-ohm. AUDIO LEGION Ultra High Quality Car Audio Amplifier. One Year Warranty Through Audio Legion! Authorized dealer for Zapco, Image Dynamics, Audio Legion, Phoenix Gold, Pioneer, JVC, Atrend Enclosures and More! Hooligan SPL Series competition amplifiers. Engineered in the US, manufactured in South Korea, and Independently Tested vs. Competing amplifiers. Use to power the best subwoofers in the market.Specifications. Increases bass response from your system. 1 Ohm RMS Power (14.4 V) Per Channel: 1 x 5000W. 2 Ohm RMS Power (14.4 V) Per Channel: 1 x 2800W. 4 Ohm RMS Power (14.4 V) Per Channel: 1 x 1500W. 1 Ohm RMS Power (16V) Per Channel: 1 x 6500W. DVD’s, speakers, amplifiers, car stereos or electrical system failure. 1 Ohm RMS Power (14.4V) Per Channel: 1 x 8500W. 2 Ohm RMS Power (14.4V) Per Channel: 1 x 4300W. 4 Ohm RMS Power (14.4V) Per Channel: 1 x 2300W. 1 Ohm RMS Power (16V) Per Channel: 1 x 10800W. DVD’s, speakers, amplifiers, car stereos or electrical system failure. 1 Ohm RMS Power (14.4 V) Per Channel: 1 x 3500W. 2 Ohm RMS Power (14.4 V) Per Channel: 1 x 2100W. 4 Ohm RMS Power (14.4 V) Per Channel: 1 x 1100W. 1 Ohm RMS Power (16V) Per Channel: 1 x 4600W. DVD’s, speakers, amplifiers, car stereos or electrical system failure. This is a rare old school Soundstream Tarantula TRX1000D. it was a powerful amp but now goes into protection mode so being sold as is. the board looks clean. so should be an easy fix. It includes the box manual andamp. I believe this is before Maxxsonics because I couldn’t find a logo anywhere unless I accidentally overlooked it. The DS18 Hooligan-8K Is a Monoblock Class D Amplifier. HOOLIGAN SPL MONOBLOCK AMPLIFIER 8000 WATTS RMS. RMS @ 4-Ohms: 1 x 3000W. RMS @ 2-Ohms: 1 x 5000W. RMS @ 1-Ohm: 8000W.